Apparently Danny Cohen, the BBC Director of Television, is struggling to work out the fate of Top Gear presenter Jeremy Clarkson. He has already described those defending Clarkson as being like those who covered up Jimmy Savile’s paedophilic predations. The Mail, in its typically confused manner, has implied today that Cohen accused Clarkson of paedophilia. Obviously, this cannot go on. 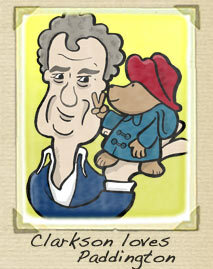 It is tedious beyond belief, and Clarkson should have been sacked years ago. But Top Gear is ‘the most-watched “factual” programme in the world’, and a huge money-spinner. No wonder Cohen knows what to do but cannot manage to do it. It seems to me the answer is clear. The BBC should take Clarkson back, but return Top Gear to the format originally proposed by JG Ballard.